Did the U.S. Just Accidentally Give Weapons to ISIS? It didn't take long for the White House to bat down the suggestion from President Obama's top military adviser that should the president's plan for airstrikes fail, the United States should deploy ground forces to fight the Islamic State. 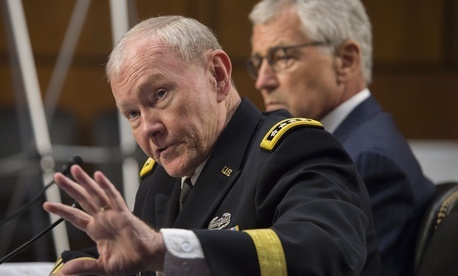 Gen. Martin Dempsey, the chairman of the joint chiefs of staff, made the comments Tuesday morning in a Senate Armed Services Committee hearing examining the threat from ISIS and Obama's strategy for destroying the terrorist group. The chairman endorsed the president's plan for U.S.-led coalition airstrikes and the training and arming of the Iraqi army and moderate Syrian rebels, which does not include U.S. combat troops on the ground. But he said he was prepared to change his recommendation if necessary. My view at this point is that this coalition is the appropriate way forward. I believe that will prove true. But if it fails to be true, and if there are threats to the United States, then I of course would go back to the president and make a recommendation that may include the use of U.S. military ground forces." Obama has repeatedly and specifically ruled out a U.S. ground combat mission as he has sought to emphasize that the war he is waging against ISIS will not resemble the years-long U.S. invasions of Afghanistan and Iraq of the last decade. Dempsey acknowledged that was the president's "stated policy," but he added that Obama "has told me as well to come back to him on a case-by-case basis." White House press secretary Josh Earnest moved swiftly to slam it shut while briefing reporters aboard Air Force One as Obama traveled to Atlanta for a briefing on the Ebola outbreak at the Centers for Disease Control and Prevention. As was clear form General Dempsey's remarks he was referring to a hypothetical scenario in which there might be a future situation in which he might make a tactical recommendation to the president as it relates to ground the use of ground troops." He added that while it was the military's job to plan for a wide range of contingencies, it was the president's job to set policy. The president has been clear what that policy is. What he has been very specific and precise about is he will not deploy ground troops in a combat role into Iraq or Syria." While Republican hawks have criticized Obama for ruling out ground troops in advance, the debate has been muddled somewhat as others point out that the hundreds of military advisers the U.S. is sending to Iraq are essentially "troops on the ground." The White House counters that they are different because they are not engaging in a combat mission against the terrorists, which is left to the local armies.